Known for decades as Ultra Violet Products Co., UVP was founded in 1932 and remains headquartered in the greater Los Angeles area. The company manufactures bioimaging systems for academic, biopharmaceutical, and biotechnology applications. Their bioimaging systems are used for genomic, proteomic and invivo applications while their laboratory instruments and ultraviolet products are employed for academic, pharmaceutical, forensic, industrial and biotechnology applications. UVP bioimaging systems are used for DNA gel documentation and image acquisition, analysis of gels, blots, fluorescence, chemiluminescence, western blots, northern blots, southern blots, luminescence, colorimetric, chromagenic, densitometry, in vivo and in vitro, plates, and film. The company provides UV Transilluminators, UV crosslinkers, UV incubators, PCR hoods, HEPA PCR Workstations, UV lamps, hybridization ovens, UV light sources and radiometers. It also offers VisionWorks LS, an image acquisition and analysis software including Doc-It LS software for image analysis. 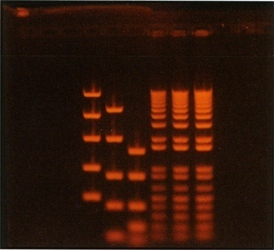 Right: back illuminated staned DNA Gel. Images taken through UVP PhotoDoc-It™ Imaging System (28,448 bytes). Above: white light and fluorescent marked cell colony in Petri dish. Images taken through UVP ColonyDoc-It™ Imaging Station (114,434 bytes). and optical properties including color correction in Nanometers at various Fraunhofer color lines (C to K). Company Seven offers the broad selection of ultraviolet (UV) sources made by UVP. When choosing a UV lamp for your applications keep in mind it will be the UV output (in terms of wavelength and energy levels), the form of the lamp, and its power requirements will most likely dictate what uses the lamp is suited for. The dimensions and weight of the lamp will often impose limits regarding how and where it may be employed too. To help our customers select from the numerous choices we have written extensively about these products, not just cutting and pasting the manufacturers text into our pages but actually explaining to our customers how to go about choosing a good solution for their own goals. In our experience the best lamp will be the one that gets used, and it will be the one that you find rewarding to use too. The lamp may be a portable model operating from battery power and able to be hand carried, or the lamp may be much larger and heavier units best suited for installations into cabinets. We characterize the degrees of portability as: pocketable, compact, handheld, desktop, and display. And we explain more about the differences and how to choose a UV source at our Lamps Overview page. 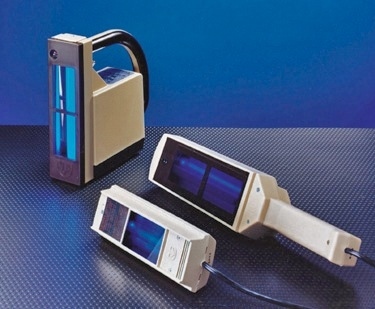 Right: examples of UVP Portable series battery powered, Compact and Handheld series and other handheld AC powered UV lamps (40,726 bytes). 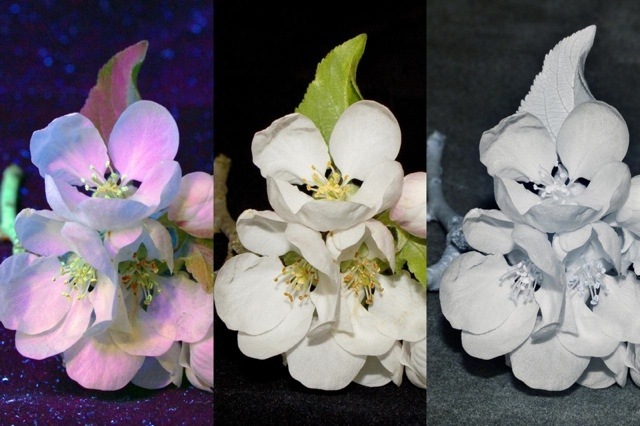 These following images were taken under natural light, then while exposing the samples to ultraviolet lamps, and then in infrared (IR). With special lenses and cameras images can be taken of these UV and IR portions of the spectrum where the subject will be otherwise invisible to the naked eye, but these images cannot be captured by a common digital or film camera. The fluorescent, phosphorescent and tenebrescent effects of the ultraviolet on a sample can be seen by the naked eye, hence these effects can also be captured with common consumer digital or film cameras. We discuss this in some detail in our article Ultraviolet Spectrum Primer. However, we recommend baffling the UV source to avoid accidental exposure to people by the UV. Furthermore, eye protection and coverage as necessary (UV safety glasses, gloves, etc.) are recommended for anyone working with short wave (UV-C) light sources. Above: images taken in ultraviolet (350nm), visible and infrared for comparison (100,722 and 108,277 bytes) through special Nikon UV-105 F4.5 lens. Images courtesy of R. Horsnell. Click on images to see enlarged views (260,042 and 136,271 bytes). When used in security applications then an ultraviolet lamp may be used to detect security features or fraud. The ultraviolet may cause built in devices or logos to appear that might otherwise be invisible to the naked eye. Or chemicals or bleach used to alter documents may fluoresce giving away the perpetrator of the fraud. 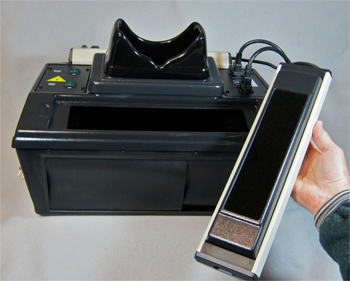 Right: The UVP security Model MSL-2M Signature Lamp (inset) facilitates the detection of fluorescence in currency, credit cards, identification badges. Show here is the illuminating of the fluorescent security strip of a US $20 note (32,208 bytes). The US Treasury Department has gradually been updating America's paper currency with higher technology features to defeat counterfeiting. Some of these devices are incorporated in paper fibers that are not obvious to the naked eye under ordinary light but that fluoresce under black light (long wave) sources. When the currency is examined under longwave fluorescent light then a security ribbon embedded to the left of the portrait of President Benjamin Franklin on the $100 bill fluoresces red, the thread to the right of President Ulysses Grant on the $50 note fluoresces yellow/orange, while the thread on the left side of the portrait of President Andrew Jackson on the $20 bill fluoresces green, the thread of the $10 bill with President Alexander Hamilton is red, and that of the $5 bill with President Abraham Lincoln is blue. Even though the fluorescence intensity of the security threads appears to decrease with use and handling, the security ribbon emission bands are wide and clearly distinguish each bill. 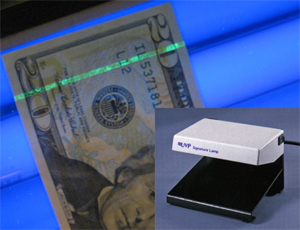 The security thread is the only component of authentic U.S. currency that will fluoresces under black light. If the ink, the paper, or other feature fluoresces, then the bill is a counterfeit or has been altered. One of the more common experiences for the amateur will be to observe fluorescence of mineral samples. The following images were taken under natural light and then while exposing the samples to ultraviolet lamps. Above: Example of mineral fluorescence and phosphorescence. 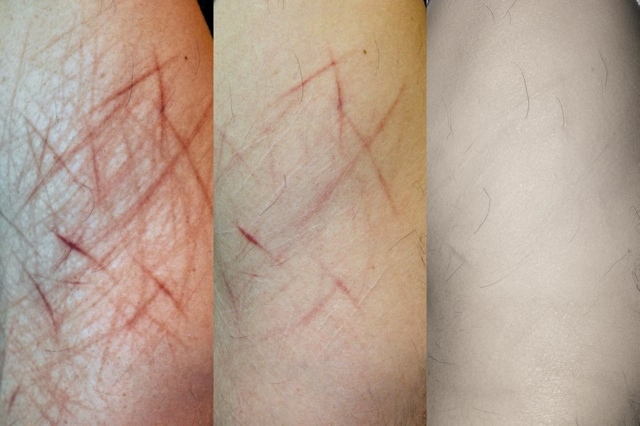 At left in natural light, then two images during and after exposure to UV-C. The fluorescence is dramatic; under UV-C the sodalite glows a bright orange and the lujavrite matrix glows a bright green (uranyl activated). When the light is turned off the sodalite phosphoresces orange. Exhibit courtesy of Company Seven (41,897 bytes). Click on image to see enlarged view (133,951 bytes). Above: Examples of mineral fluorescence and tenebrescence*. At left is sample in natural light, then exposed to UV-C, then UV-A, then tenebrescent afterwards. mineral rather than a coating of uranyl salts. The sodalite is nicely tenebrescent, and of course very fluorescent. Exhibit courtesy of Company Seven (95,144 bytes). Click on image to see enlarged view (290,163 bytes). * Tenebrescence also termed reversible photochromism, is the ability of some minerals to change color when exposed to certain types of light. For added convenience, and for observing and imaging safety the UVP company developed a series of enclosures that incorporate one or more lamps, these are the full-size Chromato-Vue® and the compact and portable Mini Chromato-Vue® observing cabinets. Right: UVP C-65 Cabinet shown with one optional EL Series lamp attached and the other lamp plugged in but pulled off the open port (60,168 bytes). This is similar in concept to the photographic light box, but optimized for ultraviolet applications. Each of these observing cabinets brings convenience and safety to an ultraviolet observing or imaging session. The cabinet is a self contained ultraviolet laboratory where a sample may be introduced through the curtain flaps at the front and into the enclosure, an attached UV lamp provides the illumination of the sample within the cabinet for safe visual observing or for imaging through with a camera through the UV-filtered observing port at the top. These are so safe and easy to use, and the views can make such an impression that we at Company Seven consider these to be an excellent tool for school educational programs. WARNING Infrared and ultraviolet wavelengths are invisible to the human eye yet these electromagnetic waves bear energy and other information. So any structure that absorbs the light can be damaged by this energy; note how sunlight exposure tans the skin while prolonged exposure fades or breaks down materials. The photons of shorter wavelength carry greater energy therefore, these have the greater potential for causing biological damage. These wavelengths can penetrate the eye or skin cells and can produce heating and energy related biological changes that will modify or destroy cellular DNA; this is among the reasons why some UV light sources are used for germicidal (sterilizing) applications. As amazing as it can be to explore the ultraviolet spectrum, this is not child’s play! For a good overview of working in the UV and explanations of proper precautions consult Ultraviolet Spectrum Primer, the illustrated article by Company Seven explaining the ultraviolet (UV) spectrum as it applies to photographing or imaging objects in the UV and about observing fluorescence, phosphorescence, and tenebrescence. The article explains the different portions UV spectrum including UV-A (long wave), UV-B (mid) and UV-C (short wave). This also goes into a discussion of imaging gear including lenses, films and filters. Then refer to our article Ultraviolet Personal Safety Gear. 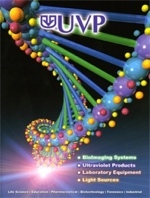 UVP Laboratory & UV Products Catalog, the complete illustrated thirty-six page catalog, cover page illustrated at right. UVP publication UV/Lab Rev 0609. Download size is 2,761,955 bytes (in Acrobat Reader ".pdf" format). Ultraviolet Spectrum Primer on-line illustrated article by Company Seven explaining the ultraviolet (UV) spectrum particulary as it applies to photographing or imaging objects in the UV. The UV-A, UV-B and UV-C are described. The article is supported with color images taken of subjects in natural light then taken in the UV shown for comparison and to illustrate fluorescence, phosphoresence, and tenebrescence. Imaging gear is reviewed including: UV sources, special microscopes and lenses (Nikon UV-Nikkor / UV-105 F4.5, Zeiss Hasselblad UV-Sonnar, etc. ), films and filters, and CCD imaging systems. Content copyright Company Seven and respective contributors. We also host numerous related articles including applications bulletins, transmission spectra data, and products user guides at our Notes & Interesting Articles index page. Today Company Seven is a factory-authorized distributor of UVP consumer and professional products. We maintain a technically competent staff, each with at least 15 to 20 years or more experience using such equipment in addition to any formal technical and or engineering training. We have an uncommonly good theoretical and practical understanding of these products, their design and applications. It will become obvious as you browse our Internet site articles that our staff takes great interest in helping to make our customers well informed, and successful. As such Company Seven's staff can be your primary source of information regarding technical information about these products, current prices, estimated delivery dates and the status of your order. Company Seven remains one of the very few businesses in our community that maintains a showroom displaying a representative selection of special optics, UVP products and accessories. We invite you to either visit our showroom or contact us. This way you can obtain prompt and competent concise assistance which will address your particular needs and concerns.